Contact us for a tailored paper folding workshop experience that enhances your event and brand. Kids at this year’s first Wagga Wagga City Council, Spring Jam festival, Learned how to fold origami pinwheels with the team from PAPEL (PAPER). The boy who featured in season one of Channel Seven’s Little Big Shots along with his mamá ran two workshops, teaching children how to fold an origami pinwheel that could also be used as a bonus Frisbee! Over 220 kids in a two hour block created their very own pin wheels - these workshops ceated over 2,200 folds! These kid-friendly origami entry level workshops provided all the material needed and they are sponsored by the City of Wagga. It was a glorious paper mayhem. Workshops will be held at the PAPEL (PAPER) tent. 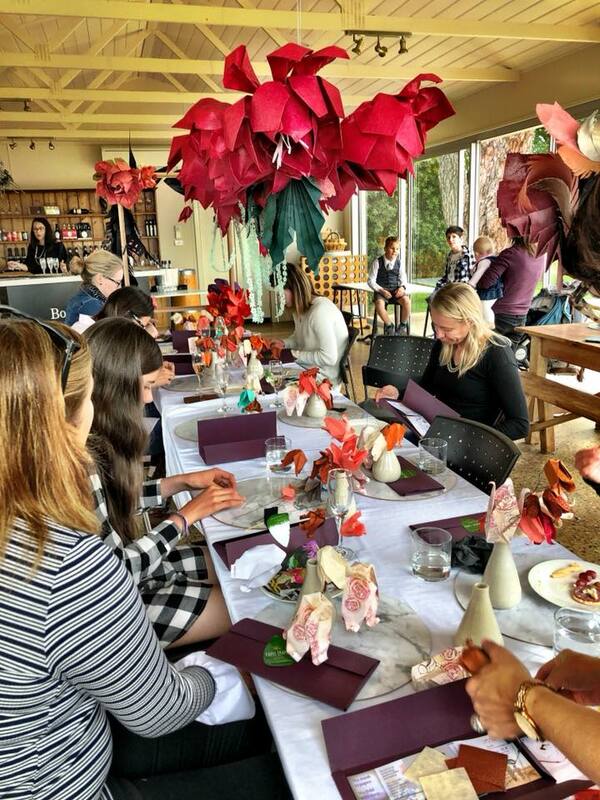 Borambola Wines hosted PAPEL (PAPER) at their boutique cellar door for an enchanting paper folding session whilst sipping on Borambola VIII Sparkling Brut, soaking in the scenery and nibbling away on some delectable finger foods. Caroline Candusso, also known as, la mamá, from PAPEL (PAPER) shared her skills in a highly-anticipated workshop on Sunday May 27, 2018. Using imported handmade Nepalese paper, la mamá guided participants on how to make an arrangement of beautiful Fritillaries (bell-shaped flowers). At the end of each class, everyone took away with them a creation of their own, something that is both beautiful and everlasting in a custom made vase by a local potter designed specifically for this flower fold. Caroline, la mamá from PAPEL (PAPER) said, "It was an extraordinary day and a most delightful way for people to have come together in the most beautiful location at Borambola Wines”. Naomi Miller, Chief Marketing Officer said, "Borambola Wines are looking forward to partnering with Caroline from PAPEL (PAPER), and seeing the cellar door coming alive with creativity and colour. It will be a unique experience, and a lovely way for people to spend time together".